← Some Pool Events to think about! Don’t Forget, swimming at Sandycove is year Round. There may not be a problem with parking, and you may not bump into many people while out in the water, but still, people are meeting up. 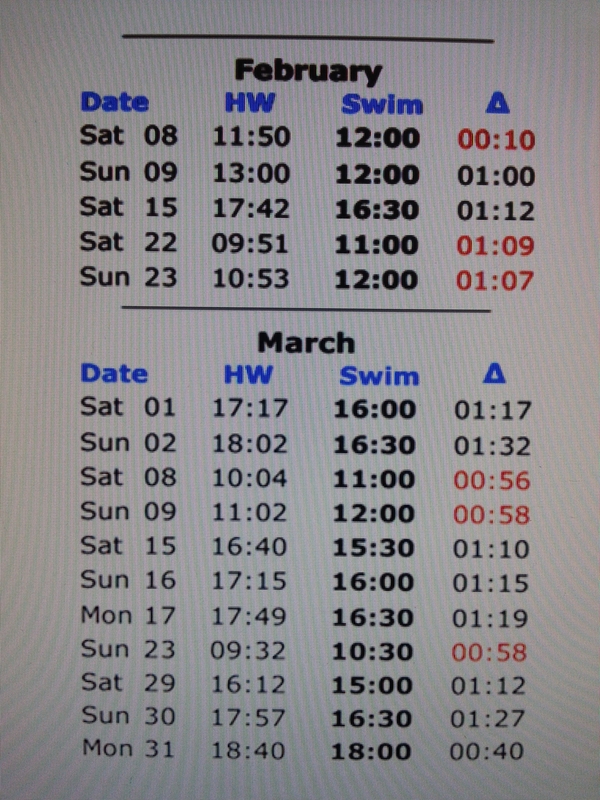 Have a look at the Sandycove Schedule on the website (it is under ‘calendar’ Tab on the menu above). But here are some upcoming dates at a glance. Remember, Swim Smart, Know your limits in the cooler climate we have now (winter!). The sea temps may be around 8deg but the much cooler air temp will make it harder to warm up, so bring the layers and the warm drinks for after your swim. And don’t ever swim alone.! Finally, there is a regular gang swimming from Myrtleville Beach Every Saturday morning at 8.15am and sometimes at 4.30pm on a Monday and Thursday!. Check the Myrtleville website to keep up to date with definate weekday times. If you are on Twitter, Damian mans the account @MyrtlevilleS with updates. !